Connected devices such as iPads have been welcomed into many UK households and offices alike, bridging the gap between consumer and professional electronics. Here, trade show solution expert, Printdesigns, shares some tips on how marketing professionals can utilise and integrate these portable tablets into their next exhibition stand strategy and design. While the power of a clear, concise classic banner stand solution cannot be argued, incorporating an iPad into an exhibition stand adds an element of interactivity that can increase engagement, spark interest and ultimately, capture leads. Gamification and adding elements of fun to a stand is a popular way to draw visitors to any booth, making a business stand out from the crowd and helping to form an emotional connection with a company. Something as simple as creating a branded photo booth or an original app to display on the iPad instantly boosts audience interaction, generating further interest. However a business decides to utilise an iPad on their booth, professional, reliable display stand solutions are needed to ensure the tablet is showcased securely, while keeping in line with the appearance of the entire display stand. Alongside its leading range of classic exhibition stands, Printdesigns hosts a selection of iPad stands and accessories to make integration simple. 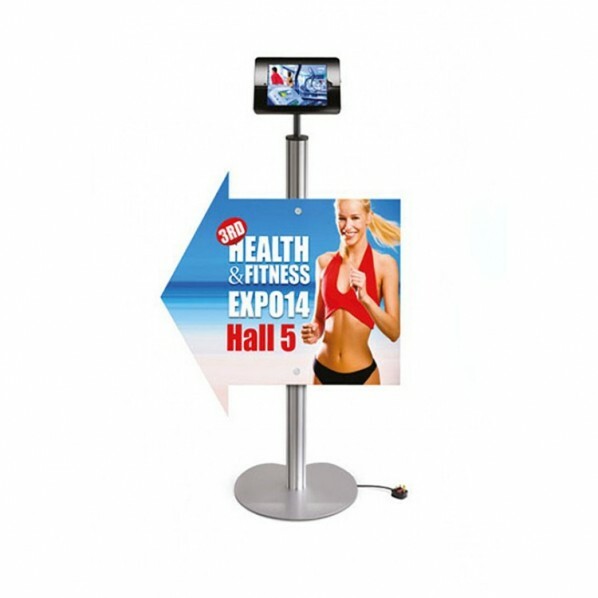 Compatible with the display stands it sells online, the Design iPad Holder enables businesses to add the portable technology onto its existing trade show solutions. However, for added versatility, the iPad 360 acts as a secure housing unit that can rotate to any angle and can be attached to walls, desktops or linear posts. Businesses looking for a long lasting branded display will also benefit from the Swift Promotion 360 Counter, a high impact customisable cylindrical counter, with an iPad integrated into the tabletop. © Printdesigns Ltd 2010. Web & User Interface Design.